Hendrik Lundqvist continued his storng play in net for the Rangers, as he stopped 19 shots and two shootout attempts for a 3-2 win over Buffalo. When Scott Gomez joined the New York Rangers this past summer, he not only brought his unique playmaking abilities, but also the intangibles that came from seven seasons immersed in a culture of winning. So it wasn’t surprising that after scoring the decisive shootout goal against the Buffalo Sabres on Monday night, Gomez drew upon the experience with his former organization in talking about what the hard-charging Rangers want to accomplish down the road. To that end, the Rangers gained another two points with their second shootout victory in as many days and are now 10-0-3 since Feb. 9. They moved into a tie with Ottawa for fifth in the Eastern Conference and sit only three points behind New Jersey, which leads both the Atlantic Division and the East. After Brendan Shanahan scored in the first round of the shootout for the Rangers and the Sabres’ Jason Pominville tied it at the start of the third round, Gomez skated in on Ryan Miller, faked right and slipped the puck just inside the left post and under the pads of the spread-eagled Buffalo goalie. Fedor Tyutin and Jaromir Jagr scored in regulation for the Rangers, who finished a four-game sweep of the season series with the Sabres. Pominville and Thomas Vanek tallied for Buffalo, which saw defensemen Jaroslav Spacek and Dmitri Kalinin leave the game with injuries. The Sabres pulled to within three points of Philadelphia for the eighth and final playoff spot in the East, but the Flyers now have a game in hand. The Rangers played 65 minutes of scoreless hockey Sunday before prevailing in a shootout against Boston, but neither team sat back at the start of Monday’s game. Each side had a goal on the board in the first 90 seconds of play. On the opening shift, Pominville worked the puck free along the boards in the offensive zone, then drove to the front of the net. Jochen Hecht worked the puck to Paul Gaustad, who then found Pominville for a drive past Lundqvist with just 16 seconds elapsed. Tyutin got the Rangers even at 1:22 when he found himself uncovered in front of the net and converted a Nigel Dawes pass for his fifth of the season. Jagr’s 18th gave the Rangers a 2-1 lead at 8:26 of the second period and was set up by Sean Avery in more ways than one. Avery’s crunching check left Sabres defenseman Nathan Paetsch down on the ice. The officials allowed play to continue since the Rangers had the puck, and Avery was able to take a Brandon Dubinsky pass behind the net and find Jagr in front. Vanek’s power-play goal less than six minutes later tied the score. Vanek deflected a Pominville drive over Lundqvist’s shoulder and just under the crossbar for his team-leading 28th goal. Both teams had great opportunities to win in the final minute of overtime. 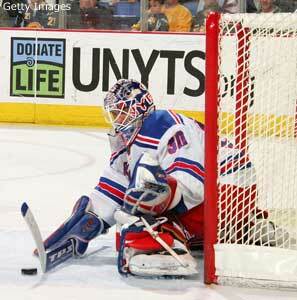 First, Lundqvist got his pads down to stop Maxim Afinogenov on a breakaway. With about 10 seconds remaining, Dawes took a Gomez pass off a 3-on-2 rush and rang a shot off the crossbar. Miller stopped 24 shots for the Sabres but was topped by Lundqvist, who made 19 saves and improved to 8-0-2 in his last 11 appearances.